An exponentially modified Normal continuous random variable. As an instance of the rv_continuous class, exponnorm object inherits from it a collection of generic methods (see below for the full list), and completes them with details specific for this particular distribution. where the shape parameter K > 0. It can be thought of as the sum of a normally distributed random value with mean loc and sigma scale and an exponentially distributed random number with a pdf proportional to exp(-lambda * x) where lambda = (K * scale)**(-1). The probability density above is defined in the “standardized” form. To shift and/or scale the distribution use the loc and scale parameters. Specifically, exponnorm.pdf(x, K, loc, scale) is identically equivalent to exponnorm.pdf(y, K) / scale with y = (x - loc) / scale. An alternative parameterization of this distribution (for example, in Wikipedia) involves three parameters, \(\mu\), \(\lambda\) and \(\sigma\). In the present parameterization this corresponds to having loc and scale equal to \(\mu\) and \(\sigma\), respectively, and shape parameter \(K = 1/\sigma\lambda\). rvs(K, loc=0, scale=1, size=1, random_state=None) Random variates. 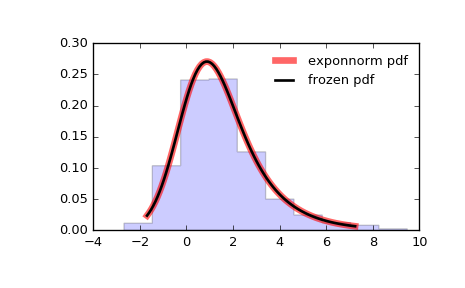 pdf(x, K, loc=0, scale=1) Probability density function. logpdf(x, K, loc=0, scale=1) Log of the probability density function. cdf(x, K, loc=0, scale=1) Cumulative distribution function. logcdf(x, K, loc=0, scale=1) Log of the cumulative distribution function. sf(x, K, loc=0, scale=1) Survival function (also defined as 1 - cdf, but sf is sometimes more accurate). logsf(x, K, loc=0, scale=1) Log of the survival function. ppf(q, K, loc=0, scale=1) Percent point function (inverse of cdf — percentiles). isf(q, K, loc=0, scale=1) Inverse survival function (inverse of sf). stats(K, loc=0, scale=1, moments='mv') Mean(‘m’), variance(‘v’), skew(‘s’), and/or kurtosis(‘k’). entropy(K, loc=0, scale=1) (Differential) entropy of the RV. fit(data, K, loc=0, scale=1) Parameter estimates for generic data. expect(func, args=(K,), loc=0, scale=1, lb=None, ub=None, conditional=False, **kwds) Expected value of a function (of one argument) with respect to the distribution. median(K, loc=0, scale=1) Median of the distribution. mean(K, loc=0, scale=1) Mean of the distribution. var(K, loc=0, scale=1) Variance of the distribution. std(K, loc=0, scale=1) Standard deviation of the distribution.